For fast, easy driving of nuts, bolts and hex head screws. Rugged single-piece construction provides long life under constant use. The precision formed tip ensures a proper fit. Includes (1) one each: 3/16", 1/4", 9/32", 5/16", 11/32", 3/8", 7/16" sockets; 2" socket adapter. Universal 1/4" hex shank with power groove. Lobular design reduces stripping damage by driving the fastener on the side instead of forcing the corners to turn. For use sheet metal screws and other hexagonal head fasteners. Provides more clearance on the corners of the fastener where paint build-up can occur. Set includes 3 Magnetic Nutsetters (94812, 94832 and 94852). Sizes: 1/4", 5/16" and 3/8". Lobular design reduces stripping damage by driving the fastener on the sides instead of forcing the corners to turn. 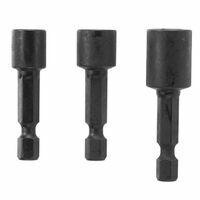 For use with sheet metal screws and other hexagonal head fasteners; 1/4" hex shank. Includes 1 each: 1/4", 5/16" and 3/8". Steel and heat treat process for maximum strength, durability with a strong magnetic tip for a secure grip. Color coded band for easy size identification and chamfered edge for fastening in tight spaces. Includes (1) each: 1/4", 5/16" and 3/8". Provides convenient pick-up and retention of hex fasteners. Lobular design drives along flats to reduce rounding of hex fasteners. Flat edges at hex opening for full contact with flanged hex head screws. Performance-optimized S2 steel construction for extended life. Calibrated heat treating process for added durability. Manganese phosphate surface for advanced corrosion resistance. Ideal for driving hex head nuts and self-tapping screws in a wide variety of applications. For use with high torque impact drivers and driver-drills. For use with a power drill. Set includes (1) of each: 7/16'', 3/8'', 5/16'' and 1/4'' nut driver. Made of high quality S2 tool steel; 1/4" hex shank. Includes (1) one each: 1/4", 5/16", 3/8" and 7/16". Use with high torque impact drivers and driver-drills. Retention ball for secure fit to the socket. Chamfered edges at square drive end for easy fit into socket. Performance-optimized S2 steel construction for extended life. Includes: ImpactX 3 Pc. 2" Socket Adapter set.